Forget Folgers. They may have made this phrase famous but I didn’t grow up with Folgers in my cup. Our traditional north Indian home didn’t believe in coffee (that’s something I learned about when I branched out on my own). 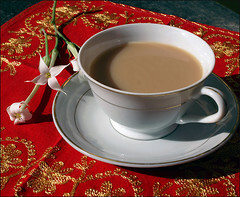 Instead each morning was greeted with the wonderful aroma of Chai tea brewing on the stove. It would tempt us awake from the deepest slumber, lead us out of my zombie state and into our robes and slippers, and put us into a dream-like trance with silly smiles on our faces. Our close knit family believes in dinner around the table and a strict tradition of morning and afternoon Chai. Food always brought us together, encouraged a conversation, and was our time to bond. Chai was always served with an Indian pastry or my Dad’s favorite pecan cookies. It was never served plain and there were no additives like sugar considering it’s known for its spicy (masala) taste. If you’re drinking Chai in the form of a powder or getting it at coffee shops chances are you’re getting something Americanized or sweetened with vanilla, honey, or cinnamon. It’s sad to think that most people think this is the norm however I suppose every recipe can be modified to fit a personal need. I prefer mine the way it’s supposed to be made – spicy. In our household, my Dad makes the best tea (just like his eggs) and it’s probably because of his attention to detail, the love he has for us and his dishes, and his passion. If he’s having a bad day, it’ll reflect in his cooking. While I was home last Thanksgiving, I took some time to film my Dad’s signature masala Chai tea. The video is a bit long (17 minutes) but be prepared to take notes if you’re looking to duplicate the recipe on your own.